5039/T5 - Gold frame and brown polarized lenses. 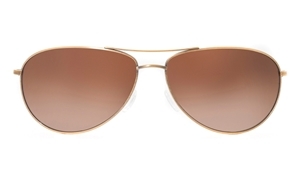 The Oliver Peoples Tavener OV 1147 is a unisex titanium metal aviator that has polarized lenses.. The sunglass is logo free . The Oliver Peoples Tavener OV 1147 comes with its own branded case, cloth and packaging, and covered by the 12 month no quibble Sendoptics guarantee. 5129/6U - Gold frame and graduated brown lenses.